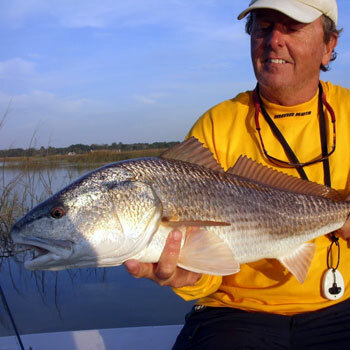 Capt David Edens, a professional fly fishing guide knows the Golden Isles , its his backyard. The Golden Isles stretch along 100 miles of Georgia's coast and are home to some incredible redfish. Imagine being poled down a low tide flat, fly fishing for red fish, with so many red fish they bump the bottom of the boat. Join us for another adventure. Since those early years, Capt. Dave has fly fished for trout, Steelhead, Stripers, Salmon, False Albacore, Bonefish, Permit, Tarpon, Red Fish, Triple Tail, Sea Trout, Bream, Carp, Bass and anything else that would take a fly from Alaska to the Bahamas, from Vermont to California and many of the states in between. He is an Orvis Endorsed Fly Fishing Guide. He is a Federation of Fly Fishers Certified Casting Instructor and a member of the FFF Professional Guides Association. He has been building custom fly, spinning and casting rods for over fifteen years under Blue Ridge Rods and has been certified by the Rod Guild as a Professional Rod Builder. Capt. David Edens is the owner of Fly Cast Charters and Outfitters, LLC in St. Simons, GA. The tag line of the charter service is “Hunting Fish in the Marshes of Glynn.” He specializes is sight fishing for red fish, and is available for fly and light tackle charters for all of the other species and around St. Simons Island, Sapelo Island, Sea Island, Cumberland Island and Jekyll Island, Georgia.